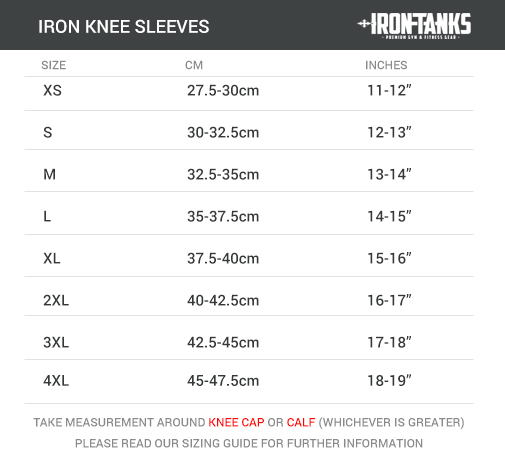 Introducing Iron Tanks' latest development, their Iron Knee Sleeves V2. Now features their new neo-tech lining for ease of use and brutal support! Constructed from the highest competition grade 7mm neoprene - Iron Tanks sleeves provide unrivalled stability, compression & support around the knee joint. Iron Tanks sleeves are 30cm in length for maximum coverage and support. Iron Tanks sleeves generate warmth, keep the joint lubricated and increase blood flow to the area. Suitable for all athletes, from casual gym-goers to professional powerlifters, strongmen and bodybuilders. We firmly believe these sleeves are the best on the market. This is a standing measurement around the middle of the knee cap. If your calf is bigger than your knee, please take the greater measurement. Sam measures 43cm around the knee cap - using the size chart on the product page (or see above for it) he fits into the range for an '3XL' size set of sleeves. This would be suitable for a normal fit - slight difficulty getting them on initially, but still providing a heap of support and warmth around the knee. For a 'competition' fit, he might select the '2XL' size. Keeping in mind, these will be tight and difficult to apply for maximum support and stability. There are a few techniques for getting knee sleeves on - initially they will be quite difficult to put on, which is normal. If you're patient, and correctly apply them - they are the toughest sleeve on the market and built to last. Step 1 - Please be standing with your leg straight. Step 2 - Take a measure around the middle of the knee cap. Step 3 - Take a measure around the biggest section of your calf. Step 4 - Use the bigger measurement and then refer to the size chart. Step 5 - For a competition fit, select the size down - but please ensure you are well acquainted with competition fits before doing so.